Popsicles represent the epitome of summer sweetness. For me they conjure memories of groups of neighborhood children chasing down ice cream trucks, getting messy, and washing up with front yard water hoses. What better way to pay homage to those sweet memories than making avocado popsicles, a healthier version of a classic summer treat. 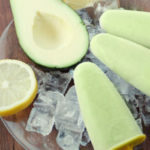 Summer is the peak of avocado season, so making avocado popsicles at home is a perfect way to capture the freshness of the season in a satisfying snack that’s packed with protein, fiber, and healthy fats. Avocado and banana to give them the smoothness of rich ice cream. Raw honey adds that sweetness you crave. And with less than 130 calories you’ll not feel guilty indulging a little. Avocado and banana make these popsicles taste like rich ice cream, but they have less than 130 calories. With protein, fiber, and healthy fat, they're a satisfying snack. Place avocado, banana, yogurt, lime peel, lime juice, honey, and 1 Tbsp. water in blender; cover. Blend until smooth. If mixture is too thick add additional water. Pour avocado mixture evenly into ice pop molds; freeze for at least four hours, or until set.